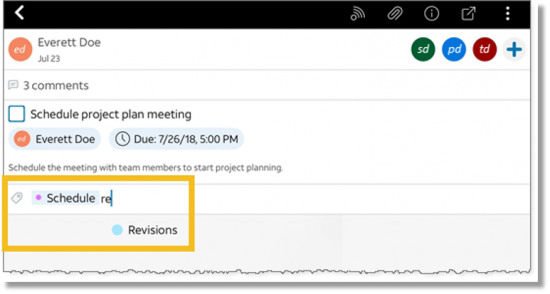 Adding tags to your notes, tasks, and files helps you organize your work and makes the items easier to find by searching or filtering. 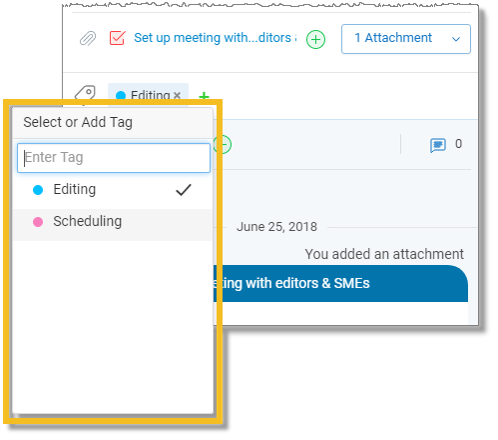 In the panel at the upper-right, click the Notes, Tasks, or Files icon, depending on the type of item you want to tag. A list of notes, tasks, or files appears. Click the item in the list you want to tag. In the tags section, click the Add icon . In the Select or Add Tag window, select an existing tag or enter the name of a new tag. You can select or enter multiple tags. In the panel at the upper-right, tap the Notes, Tasks, or Files icon, depending on the type of item you want to tag. A list of notes, tasks, or files appears. Tap the item in the list you want to tag. Tap in the tags section and start entering a tag name. Existing tags that match your entry appear.